Click here for complete dynasty tight end rankings. The top four is a consensus with Jimmy Graham, Rob Gronkowski, Julius Thomas, and Jordan Cameron. Big risers this month include rookie Colt Lyerla, who doesn’t have much competition in Green Bay; Adrian Robinson who is the de facto starter for the Giants now; and rookie C.J. Fiedorowicz in Houston where new coach Bill O’ Brien loves to run with two tight ends. The drops this month include two second year, Rice University products in Luke Willson of Seattle and Vance McDonald of San Francisco. Neither have progressed past second string in their respective offenses but still have some potential if they get opportunities. This entry was posted in Tight Ends and tagged adrian robinson, c.j. fiedorowicz, colt lyerla, dynasty tight end rankings 2014, jimmy graham, jordan cameron, julius thomas, luke willson, rob gronkowski, vance mcdonald. Bookmark the permalink. I hope Robinson pans out,picked him up on the wire late last year.lyeryla is the talk of the town, but I hear he come with lots of baggage is he worth the risk? Robinson will get a shot, for sure. 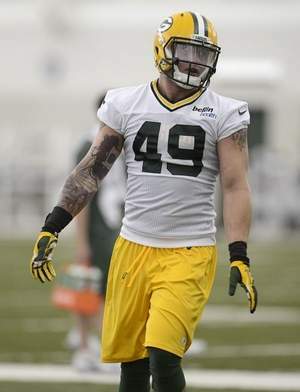 With Lyerla, the reason he’s getting buzz is the talent plus the situation in Green Bay. Personally, if you can grab him in later rookie drafts, do it. But nothing earlier than the late 2nd / early 3rd.